Lamberts Lecithin Granules - one of the richest natural sources of two important nutrients; choline & inositol in health supplement form. 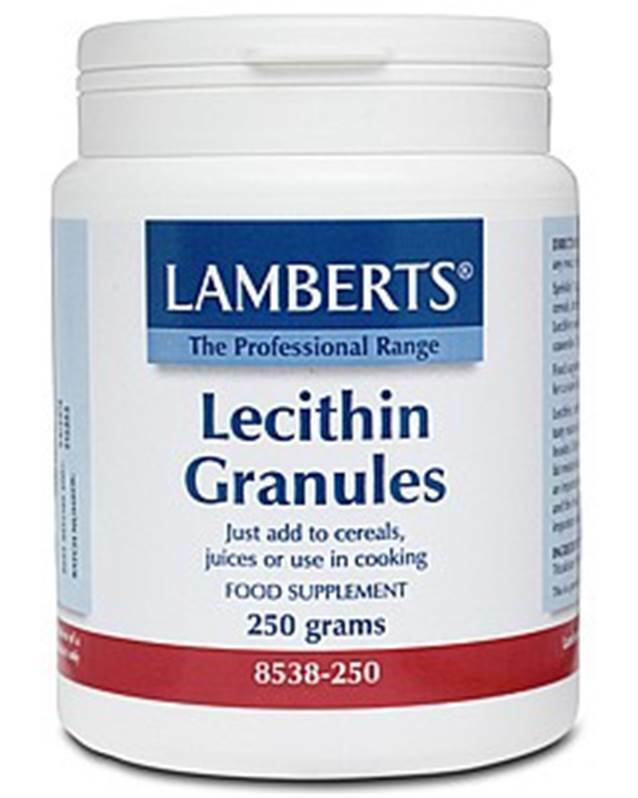 Lamberts® lecithin granules have a pleasant mild taste and can be sprinkled on cereals, or used to thicken sauces and are therefore useful for anyone wanting to supplement their diet with high levels of this nutrient. Lecithin, technically referred to as a phospholipid, is one of the richest natural sources of two important nutrients; choline and inositol. They are both lipotropic agents that play an important role in fat metabolism in the liver and the emulsification of fats in the body. Lecithin is a primary source of choline (one of the B vitamins) in the diet in the form of phosphatidylcholine. Once in the body this compound is broken down to release the choline. Lecithin and choline are used in the body to build cell membranes and facilitate the movement of fats in and out of the cells. Choline is also a precursor of the neurotransmitter (brain chemical) acetylcholine, which is essential for normal brain activity. Note. It has become increasingly difficult to obtain lecithin from a non- GMO source as much of the world’s soya is now genetically modified. Lamberts® lecithin is from a non-GMO source, but this means that it will not always be the cheapest. Lecithin is a natural food material; therefore levels of it's component compounds may vary. Levels quoted are average figures. (A level tablespoon = 7.5g) 1 to 2 level tablespoons daily. The granules can easily be sprinkled onto cereals stirred into fruit juices or added to soup without affecting the flavour.